The first time I met Hugo Chavez was at the United Nations in New York in January 2003. He asked me my name, as if we were chatting between friends just getting to know each other. When I told him “Eva”, he responded “Eva, really?”[i] “Yes, Eva”, I said. “My brother is named Adan”, he said, adding, “My mother wanted me to be a girl so that she could call me Eva, and look, I appeared!” He smiled and laughed with that laugh of his, so pure and sincere it’s contagious to all those near. He appeared. Chavez, who even underestimated himself. This man appeared, larger than life, with an immense heart full of his people, pueblo, beating with homeland, patria. A human being appeared, with a great capacity to persist and stand defiantly in the face of the most powerful obstacles. Hugo Chavez dreamed the impossible and achieved it. He assumed responsibility for the grandiose and difficult tasks that remained undone from the time of independence, those that Simon Bolivar couldn’t attain due to the adverse forces against him. Chavez fulfilled those goals, turning them into reality. 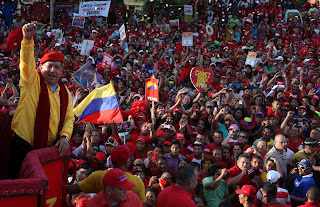 The Bolivarian Revolution, the recovery of Venezuelan dignity, social justice, the visibility and power of the people, Latin American integration, national and regional sovereignty, true independence, the realization of the dream of the Patria Grande, and much, much more. These are Chavez’s achievements, the man who appeared just like that. There are millions of people around the world who are inspired by Hugo Chavez. Chavez raises his voice without trembling before the most powerful, he says the truth – what others are afraid of saying –, he kneels before no one, he walks with firm dignity, head held high, with the people, el pueblo, guiding him and a dream of a prosperous, just and fulfilled nation. Chavez has given us the collective strength to fight inequality, injustice, to build nations and to believe that a better world isn’t just a dream, it’s an achievable reality. Chavez, a man who could spend time in the company of the world’s richest and most powerful, prefers to be with those most in need, feeling their pain, embracing them and finding ways to improve their lives. Chavez once told us a story, or told it many times as he often does. He was driving in his motorcade, out in the Venezuelan plains, los llanos, on those long roads that seem to continue infinitely. A dog suddenly appeared at the side of the road, limping with a wounded leg. Chavez ordered the motorcade to stop and went out to get the dog. He hugged the wounded animal, saying it had to be taken to the vet. “How can we leave it here alone and wounded”, he asked. “It’s a being, it’s a life, it needs to be cared for”, he said, demonstrating his sensitivity. “How can we call ourselves socialists without the lives of others mattering? We need to love, we need to care for all, including animals, which are innocent beings. We can turn our backs on no one”, he recalled. When he told that story I cried. I cried because of my love for animals and the widespread mistreatment they suffer, and how necessary it was for someone like him, Chavez, to say something like that to awaken consciousness about the need to care for those who share our planet. But I also cried because Chavez confirmed something in that moment that I already knew, something I felt in my heart, but was unsure of in my mind. Chavez confirmed his simplicity, his sensitivity and his capacity to love. He confirmed he is a man whose heart feels pain when he sees a wounded animal. A man who not only feels, but acts. That’s who he is. When Chavez assumed the presidency of Venezuela, the country was limping. He had seen its wounds and knew that he had to do all he could to help. He took Venezuela into his arms, embracing it closely, soothing and seeking how to make it better. He gave everything he had in him - his sweat, soul, strength, energy, intelligence and love – to change Venezuela with dignity, growth, sovereignty, and nation-building. He looked after it day and night, never leaving it alone. He found its beauty, its strength, its potential and its greatness. He helped it to grow strong, beautiful, visible and happy. He led its rebirth and filled its pulse with force and passion, with people’s power and a dignified homeland. Chavez has given everything of himself and asked for nothing in return. Today, Venezuela grows and flourishes, thanks to his commitment and vision, thanks to his dedication and determination, thanks to his love. Thank goodness you appeared, Chavez. [i] “Adán y Eva” in Spanish is “Adam and Eve” in English. 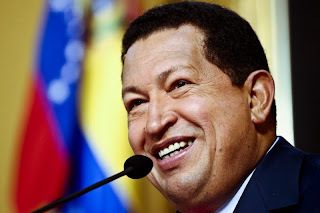 Since Venezuelan President Hugo Chavez was diagnosed with cancer and a malignant tumor was removed from his pelvic region last June, all kinds of rumors, lies and speculations have circulated about his health. Most of the hype has come from known anti-Chavez media, such as the Miami Herald and several online blogs run by right-wing extremists like Bush’s former Assistant Secretary of State Roger Noriega, who’s been obsessed with Chavez for years. All cite unnamed sources who claim they have “insider information” about the Venezuelan head of state’s health. It’s been unsurprising that those media outlets, known for their decade-long distortions of Venezuela’s reality, would publish such falsities and morbid tales about President Chavez. 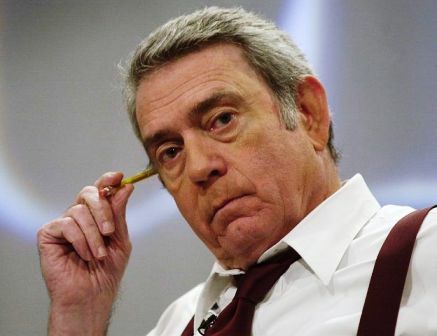 But that a serious, veteran, investigative journalist, such as Dan Rather, would indulge in the necrophiliac story-telling about the Venezuelan President is truly disappointing. Rather, who now runs his own show on HDNet, Dan Rather Reports, posted a report on Wednesday, May 30, claiming President Chavez’s health is “dire” and has “entered the end stage”. Rather also claims his unnamed “high-level” source, who he alleges is close to the Venezuelan President, told him Chavez won’t live “more than a couple of months at most”. In his brief report, which he calls an “exclusive”, Rather also bids in with his own biased language, calling the democratically-elected Venezuelan President a “dictator”.